Note from the management: Why book reviews? The fact is, I don’t want to populate this site with many more fabric definitions because I’m writing for the neophyte cosplayer and focused on fabrics that you’re likely to find at a typical retail store. Sure, my dictionaries and reference books list many, many more types of fabric than the 100 or so I’ve described here, but you’re not likely to encounter them at a typical fabric retailer, nor are you likely to need them for a cosplay project. 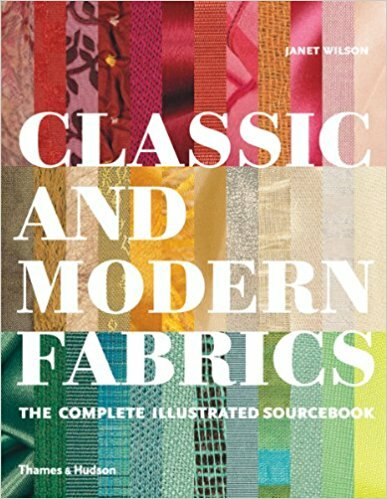 That said, here’s a book I highly recommend you add to your library, should you want to explore some of those hundreds of others: Classic and Modern Fabrics, The Complete Illustrated Sourcebook. It’s on my shelves at home (I bought it after maxing out my renewals on a county library copy!) and, I’ll admit it, I turned to it a lot when writing this website. This book is oversized and stops just short of being too unwieldy for regular use, but I forgive it that. Why? Because those big pages make for big illustrations. 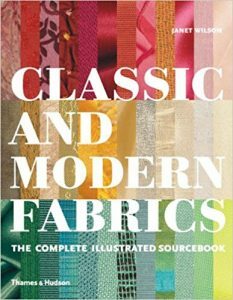 600 fabrics are described in alphabetical order, and most of them are accompanied with a quarter-page sized photo, which works out to an image about 4 inches by 5 – an improvement over the postage stamp sized images you’ll see in many other books. An introductory section explains some of the technical terms used in fabric production, but not to the point of overwhelming the reader – just enough to know why the “twist” of a yarn matters and suchlike. The entries vary in length, from a dozen words to half a page, depending on the fabric’s history and range of use. When defining the more “antique” fabrics, the author sometimes suggests modern substitutions that can be used in their place, which is always a boon to the historical costumer. The book can be found for as little as $20, used and, as such, it’s a bargain – definitely worth the space it’ll take up on your bookshelf.